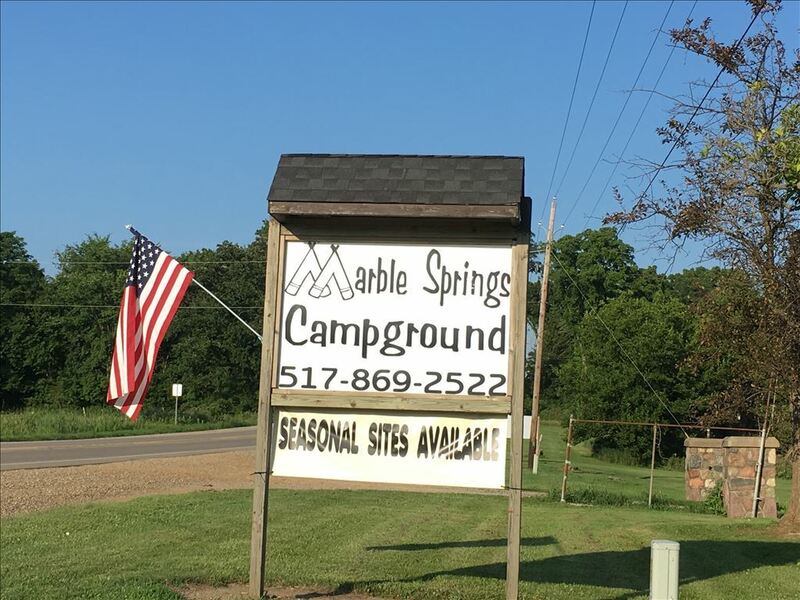 Marble Springs sits among the beautiful landscape of Southwestern Michigan. We are surrounded by multiple lakes, rivers, and streams. Hillsdale county is heavily wooded and is known for it’s large whitetail deer. On these 52 acres you can view Michigan’s only Blue Spring. This spring along with several other springs feeds all 4 ponds that are connected by free flowing streams. This is only one of 16 springs located on the property. Take a nature walk through the woods surrounding the fishing pond . Watch the turtles and frogs swim and the fish jump! Throw in a line and try your luck for this years largest fish. During the hot summer days cool off in your choice of pond or pool. There is a playground near each swimming area. CALL TODAY TO RESERVE. DON'T BE LEFT OUT OF THE FUN!! All visitors must register in the office prior to entering the camp. All visitors' vehicles must have window tag. All major holidays require a 14 day notice for cancellations. Please have your payment information available when you call for your reservation.